I'm pretty sure strawberry milk was the only way I could be talked into drinking milk as a child. This was for flavor reasons, but also aesthetic reasons (your girl went through a very serious pink phase). Don't worry: you really can make yeasted donuts. Yes, you. And here's a link to a whole bunch of other awesome strawberry recipes, as part of our seasonal #strawberriesarethejam collaboration! Be patient during the rises. Yes, you actually need to let it rise for as long as I say. In a medium sauce pan, bring strawberries, sugar, and 1 cup water to a boil over medium heat. Reduce heat and simmer until strawberries are soft, about 10 minutes. Remove from heat and stir in vanilla extract. Push the strawberry mixture through a fine-mesh strainer into a bowl. Press the strawberries with the back of a spoon to try to get out as much juice as possible, then discard the strawberry solids. Pop in the fridge to cool for a few minutes. Stir 1/2 cup of the strawberry mixture into 1 cup of milk - this will be the 1-1/2 cups of strawberry milk you need for your dough! Set the rest of the syrup aside for your glaze. In the same small saucepan you used earlier, heat the strawberry milk, water, and butter over medium low heat until the butter is melted and mixture is warm. In the bowl of a stand mixer, whisk together the flour, salt, sugar, and yeast in the bowl. Add the warm strawberry milk mixture and stir to combine. Add the eggs, then scrape the bowl down with a rubber spatula. Switch to the dough hook attachment, then turn the mixer up to medium. Mix until the dough begins to pull away from the side of the bowl, 4-5 minutes. It will still be sticky - don't worry about it! Scrape the dough out onto a floured counter temporarily. Wipe out the bowl, then lightly coat it with vegetable oil. Transfer dough back into the bowl, cover with plastic wrap, and let rise for 1 hour (until doubled in size). Turn the dough out onto a lightly floured counter and roll it out into a 1/2-inch thick rectangle. Cut into 2-1/2 inch circles using a donut cutter or the rim of a drinking glass. Cut the holes out of the donuts using the inside of the donut cutter, or the rim of a shot glass. 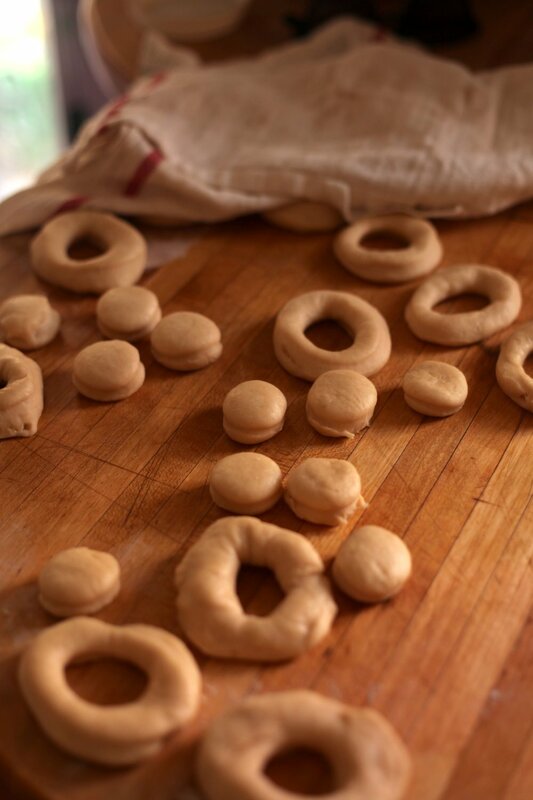 Cover cut donuts with a damp kitchen towel and let rise another 30 minutes. In the last ten minutes that donuts are rising, heat 2 inches of oil in a heavy pot or cast iron skillet to 340 degrees F.
Fry donuts for 1-2 minutes (4-5 donuts at a time), until golden brown, then flip them and fry for one more minute on the other side. Place fried donuts on a wire rack lined with paper towels to drain excess oil. Repeat with remaining donuts and holes, letting oil return to 340 degrees F between each batch. Whisk together the reserved strawberry syrup, milk, pinch of salt, and powdered sugar. Dip the slightly cooled donuts into the glaze, then set them on a wire rack to set. Serve ASAP. Best day of! Keeps covered in an air tight container up to two days.